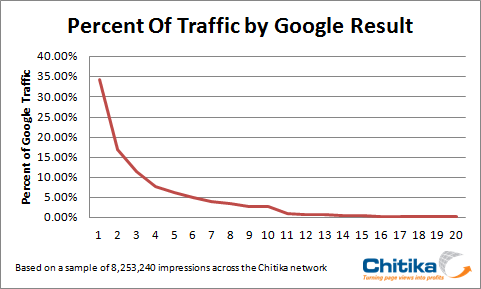 Chitika, a leading internet advertising company, has published a study in which they measured the true value, in terms of traffic, of having the #1 position in Google search results. We all know that being #1 is best, and these experiments have been done before, but this is the latest information from an authoritative source on the difference in site visitors between each position in the SERP. As you can see, the first place ranking, on average, gets about 35% of search traffic. The 2nd place rankings only gets about 17%, followed by #3 with 11% of the traffic. The value in being # is obvious. How did they come up with these figures? They took a sample of 8,253,240 impressions from their network and monitored the traffic. Seems like a pretty good sample size, and therefore the results are statistically significant. If you take a look, you can see that the largest jump in traffic is actually between the 11th and 10th rankings. The 10th position gets more than 200% of the traffic the 11th position gets. This is not surprising, since users are probably more likely to refine their search if they didn’t find a good result on the first page, rather than move on to the second page of results. The other important thing to note here is the most obvious one: the #1 result gets the same amount of traffic as results 2 through 4 combined. And when we’re talking about revenue here, you can see why some companies spend obscene amounts of money trying to get that top spot. It’s worth it. As always, my final point is, “what does this mean for SEO?” Well, this one is pretty obvious. You need to get that top spot in the search results. If you’re trying to provide the best service possible to your clients, or if you’re trying to achieve rankings for your own sites, the takeaway lesson here is to never be satisfied with anything other than a first-place position in the search results. You might like showing your clients that you’ve gotten them a 2nd or 3rd place ranking, because that is probably a huge improvement over what they had before, but you should never stop there. Keep going, get that 1st place ranking and make sure you keep it. You will see a huge difference in your traffic, your leads, your sales, etc. It’s a basic concept, I know, but it’s important to never be satisfied with anything other than #1.